… without pretension since 1995. Receive a new poem in your inbox every morning—free! of the basement and the house above it. that he spoke only in Freudian slips. drunk because it’s Christmas and cold. Notice: © 2019 Rattle Foundation. All individual works copyrighted by their authors; all rights reserved. All poems and essays are works of the imagination. While the perceptions and insights are based on the authors' experiences, no reference to any real person is intended or should be inferred. The views expressed on this website may not necessarily reflect the views of Rattle or of the Rattle Foundation. 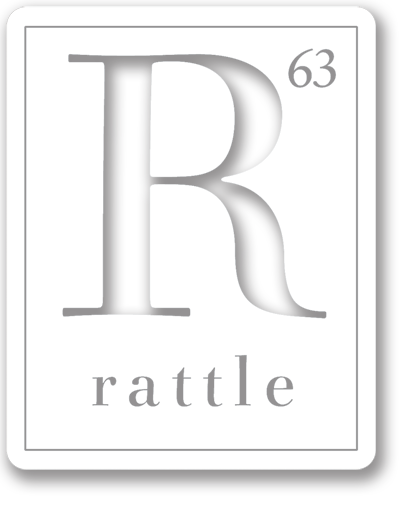 Rattle®, the R® logo design, and Poets Respond® are registered trademarks of the Rattle Foundation. The background image is from the cover of Rattle #63 by Angie Rehnberg. Theme based on Reddle by Automattic.